I come from a long line of perfectionists. My mother sews, rips and re-sews quilt squares. My brother sanded and re-stained his staircase 3 times because it wasn’t the perfect color. As a child, if I colored outside of the lines just once on a page, the whole picture was ruined. Mistakes are inevitable. 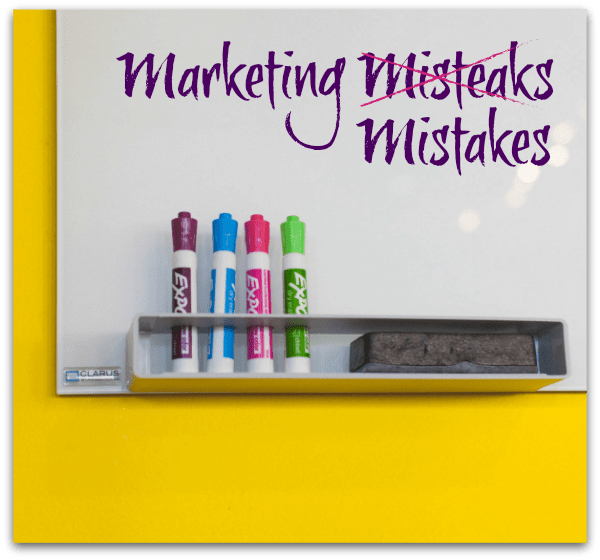 As Teddy Roosevelt said, “The only man who never makes a mistake is the man who never does anything.” However, there are some marketing mistakes that can be avoided. Check to see if you’re doing any of these. As the WhizBang! retail trainers say, “stop thinking about what you offer and start focusing on what your customer wants.” Now, more than ever, marketing has to be personalized. If you’re going to talk about your store or yourself, make it a rare feature from behind the scenes. Otherwise, your advertising needs to be about your customers. Speak to their love of treasure hunting, a good deal and the uniqueness of one-of-a-kind merchandise. Younger generations want to hear about sustainability and how earth-friendly you are. After all, these are the reasons shoppers choose consignment shops in the first place. Dig into your data from your POS system and research the most popular items and your top consignors from 2018. Use their own words from store reviews to market to them. Dotting your “i’s” and crossing your “t’s” definitely applies in marketing. Why? Your store’s marketing reflects on your store’s legitimacy. No matter how relaxed your brand is, your posts and/or tweets need to be professional. Correct your spelling and punctuation. Don’t use abbreviations or slang. Make sure your links actually work before you send them out. Research the size of images before you post so they don’t become distorted. Check Make A Website’s guide, “2019 Social Media Image Sizes Cheat Sheet.” Review the “About” section and make sure you’ve added your store’s phone number, address and website. One of my biggest pet peeves for marketing mistakes is when a store leaves a post pinned to the top of their Facebook page that’s out of date. It may be February of 2019, but that post is from April of ’18. Visitors wonder if the store is out of business. Read 8 Facebook failures you don’t want to make. I know it’s hard. You’re a business owner and most likely have a family. When do you have time to market? Don’t give in to this 3rd marketing mistake. Marketing is generally the first budget that’s cut when a business goes through a dry spell. However, this is the best time to beef up your activity. If you can’t post or tweet daily then pick a regular day and time each week. Shoppers will become accustomed to seeing your posts at that time. You don’t need to come up with new, exciting ideas every time you market to your customers either. Did something work really well for you before? Do it again. The important thing is to keep your name, your store’s hashtag and your unique inventory before shoppers as much as possible. Just don’t give up if you’re not seeing the results you think you should see. Consistency is the key to success.